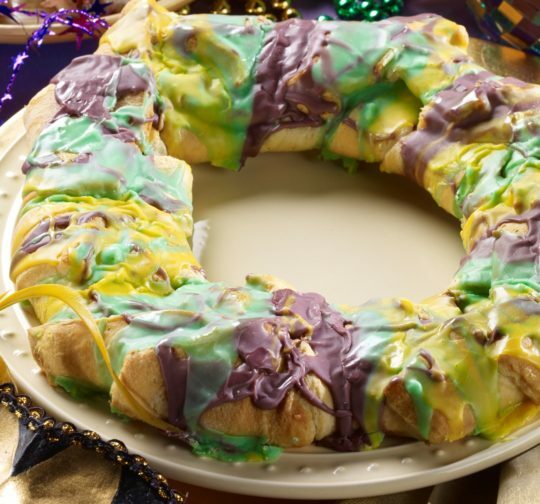 Now, you can make a quick King Cake recipe in your own home any time, without worrying about a complicated yeast dough. Kids love helping with this cake year round—try red and pink colors for Valentine’s Day, pastels for Easter, and red and green for Christmas! Recipe provided by Holly Clegg, author of Too Hot in the Kitchen: Secrets To Sizzle At Any Age. Preheat oven to 350°F. Coat 10-inch round pizza pan with nonstick cooking spray. Separate crescent rolls at perforations, into 16 slices. Place slices around prepared pan with points in the center. About halfway down from points, press seams together. In mixing bowl, beat cream cheese, confectioners sugar, and vanilla until creamy. Spread on dough in the center where seams have been pressed together. In another small bowl, combine butter, brown sugar, and cinnamon with a fork until crumbly. Sprinkle over cream cheese. Fold dough points over filling, then fold bottom of triangle over points forming circular roll like king cake. Bake about 20–25 minutes or until golden brown. Cool slightly and drizzle with colored Mardi Gras Icing. In a small bowl, combine all ingredients, except food color. Divide mixture into three bowls. In first bowl, add a few drops of yellow food coloring. In second bowl, add a few drops of green food coloring. In third bowl, add equal amounts of drops of red and blue food coloring (to create purple).